We're giving $10 in Dines Dollars for every friend you refer when they make their first purchase. To get credit, your friends must use your Personal Referral Link. You can share your referral link by including your Personal Referral Link in emails, blogs, and/or newsletters. Click here to view your Personal Referral Link. You may be required to log in first. First you need to log in to your account or register for a new account here. Then, share your Personal Referral Link using the tools provided. When someone clicks that link, we'll know you sent them. 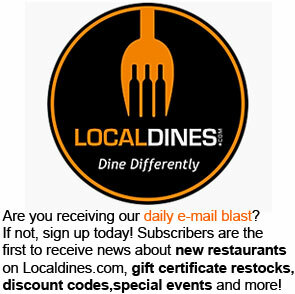 If a new account joins LOCALDINES.COM within 72 hours after clicking your link, we'll notify you within 24 hours of their first purchase* and automatically add $10 in Dines Dollars to your account. You can refer as many people as you like. LOCALDINES.COM LIMITS ACCOUNTS TO 1 PER HOUSEHOLD. Referral credits are NOT earned for referring current account holders (same billing address, shipping address, credit card, or other account info as a current account holder). Check your balance by clicking on the account balance tab, where you can also redeem your dines dollars. We can all use a little extra cash in our pockets these days. Now you can eat out at some of your favorite local restaurants for little or no cash, simply by referring a friend to our fantastic program. *Not Valid for the purchase of Dines Dollars. Certificates have no cash value. No change or credit will be issued. Certificates not valid towards tax or gratuity. Not to be combined with any other certificates, coupons, specials or promotions. Not valid on Holidays. Current Account Balance has no cash value and cannot be redeemed or exchanged for cash or cash equivalent. Restaurants reserve the right to limit the number of certificates purchased per household. LocalDines.com must RESTRICT ACCOUNTS TO ONLY ONE (1) PER HOUSEHOLD. Some of the fabulous deals our restaurants offer at LocalDines.com are limited to ONE (1) certificate per household. We must restrict the number of accounts in order for us to be fair to our customers and restaurant owners.